Click [Add Attachament] button in [Subject] field. There are two options. If you want to send a document in your local computer as attachment, select [Upload Document]. Then click [Choose File] to upload the document. 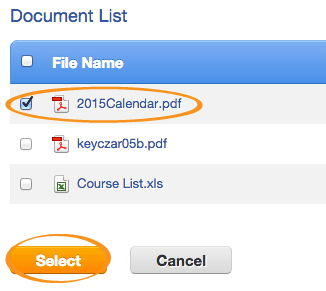 If you want to send a document you have uploaded in the system as attachment, select [Choose from File Repository]. In [File Repository], tick the checkbox of the document you want to send, then click the button [Select]. If you want to add more dcouments, click [Add] button. If you want to remove a dcoument, click [Remove] button behind the file name. The total attachment size is shown under the document list. The total size of the attachments will affect the delivery speed of the campaign.